The Houston Heights nieghborhood is so-called because it was originally built on a bluff along White Oak Bayou, overlooking downtown. In addition to the Heights proper, this area includes subdivisions such as Studemont, Norhill, Sunset Heights, and Woodland Heights. Shady Acres is located just to the west. Use these simple, one-click searches to find homes for sale in the greater Houston Heights neighborhood, Houston, TX 77008. The Heights community dates back to the 1890’s and boasts the largest concentration of historic homes in Houston. Some of those historic homes have been lovingly restored, and some are subject to preservation ordinances. Grand Victorian homes were built along the tree-lined esplanade of Heights Boulevard. The surrounding streets were populated by skilled craftsmen, who used their professional skills to give their bungalows the community’s “Carpenter Gothic” look and feel. The style remains so popular that “Retro Victorian” homes are now being constructed throughout the neighborhood. The Heights is a vibrant neighborhood, full of trendy boutiques, antique shops, and restaurants. The plentiful coffee bars come equipped with outdoor patios and porches, contributing to the community's laid back atmosphere. 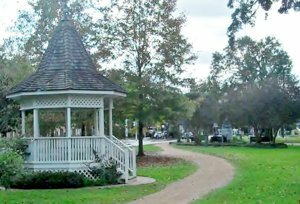 Marmion Park, in the center of the community, boasts a frilly Victorian bandstand. Two very popular hike and bike trails run N/S and E/W through the neighborhood. Homes for sale in the Houston Heights are popular with young professionals, who appreciate the short commute to downtown.